WASHINGTON, DC – Global Financial Integrity (GFI) expressed disappointment in world leaders Monday for failing to advance efforts to curtail illicit financial flows—particularly in the context of the Post-2015 Development Agenda. The G7 failure comes despite a new GFI study released on Wednesday showing the outsized-impact that illicit financial flows (IFFs) have on the poorest countries in the world, and notwithstanding a Friday pledge by UK Prime Minister David Cameron to put corruption on the agenda of the G7 Summit, which concluded today in Germany. While the G7 Communiqué does mention illicit financial flows briefly—reiterating essential previous commitments to the automatic exchange of financial information and the importance of beneficial ownership transparency—the leaders make no mention of illicit financial flows in the context of the Post-2015 Development Agenda, which is set to be hashed out in next month’s Financing for Development (FfD) Conference’s Outcome Document and in the Sustainable Development Goals this September. Likewise, the topic of trade misinvoicing—the method for channeling nearly 80 percent of all measurable illicit outflows from developing countries—is not mentioned anywhere in the document, despite lengthy discussions around trade. “We look forward to a robust agreement that: 1) mandates the IMF to regularly measure trade misinvoicing levels from all developing countries; 2) commits the world community to halve trade misinvoicing in all developing countries by 2030; and 3) requires donor countries to provide financing for trade pricing databases and training in customs departments, so poor nations can stop misinvoiced goods before they leave the ports. It’s simply impossible to produce a credible FfD Outcome Document that doesn’t commit to measuring and reducing trade misinvoicing by an explicit percentage,” added Mr. Cardamone. While GFI’s longstanding research estimates that illicit outflows drain roughly US$1 trillion from developing and emerging economies each year, the new GFI analysis reviewed illicit outflows from 82 of the poorest countries in the world and compared them to various development indices. The study found, for example, that one-quarter of them have an IFFs/GDP ratio of above 10 percent, 32 have IFFs that are greater than 10 percent of total trade, and 20 have IFFs that are greater than their combined total of inward ODA+FDI (Official Development Aid + Foreign Direct Investment). More specifically, Liberia’s illicit outflows were equivalent to 61.6 percent of its GDP, Equatorial Guinea’s annual illicit outflows averaged roughly US$4,000 per person, and Nepal’s IFFs were 186 times larger than its inward foreign direct investment. Click here for an HTML version of this press release. 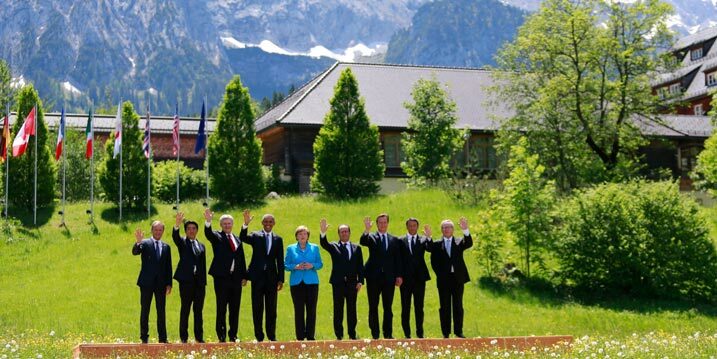 To download the 2015 G7 Leaders Communiqué, click here (PDF). To download the Annex to the communiqué, click here (PDF). For more information about the GFI report, “Illicit Financial Flows and Development Indices: 2008–2012,” published Wednesday, June 3, 2015, click here. To read a new blog post from GFI Managing Director Tom Cardamone on the impact of illicit flows on the poorest developing countries, click here.